News: October classes at AS220 Industries! MEDIA ARTS  All about photography! Workshops in digital photography, studio lighting, the Adobe Creative Suite, editing and post-production! Skill Builder: Working with Digital Photography Files, Saturday November 3, 2-5pm. You’ve taken the photos – now what? Take this skill builder class to learn about processing your images! Get those images from your camera to your computer – then the real magic begins. This class introduces students to file naming and storage, processing, and image enhancements. Cost: $50. Instructor: Kia Davis. FAB LAB   Get trained up to use the lasercutter, CNC router, 3D printers, and more! Intro to Laser and Vinyl Cutter, Mondays October 15 and 22nd, 6-9pm. Learn how to use the laser cutter to cut or etch wood, plastics, papers or textiles AND learn how to use the vinyl cutter to make stickers, signs, and more! This class will cover the basics of using the laser and vinyl cutter safely, techniques for working with different materials, and software tools for preparing work for the cutters. Cost: $100. Instructor: Ryan Pease. Intro to 3D Printing, Tuesdays October 16th and 23rd, 6 to 9pm. 3D printing is the easiest way to go from an idea to a physical object with limitless applications. Learn how to operate our in-house 3D Printers and get started on your first 3D Printing projects. 3D Models for printing can be found all over the internet, and you can even design your own. No prior experience required! Cost: $125, Instructor: Britton Kroessler. 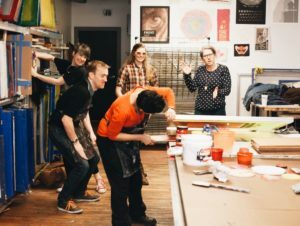 PRINT SHOP  New workshops in monotype, letterpress post-production, soft plate, and more! Intro silkscreen offered weeknights and weekends. Letterpress Post Production, Sunday, October 14, 11am-2pm. So you’ve printed on the Letterpress, now what? Find out in this post production letterpress class. Whether you are working on a broadside, a postcard or business card. This class will help you take your printed projects to the next level. Cost: $50. Instructor: Lois Harada. Silkscreen Intensive, Sunday October 28th, 10am-6pm  This course provides a comprehensive introduction to screen printing as participants design, print, and exchange a multiple color print with a maximum dimension of 8″x10″. The morning will be dedicated to creating hand-drawn stencils focusing on the design of a multiple color print. Participants spend the afternoon learning proper printing techniques, troubleshooting, and tips for registration. The workshop will end with a print exchange. Cost: $100. Instructor: John McCaughey. Soft Plates I: Monotype Studies. October 28 and November 4, 11am to 2pm. In this class, students will be introduced to the process of platemaking and monotype. The instructor will demonstrate monotype and platemaking techniques using monotype-relief plates that students make during the class. These ‘soft plates’ will be printed on the Printshop’s Takach Etching Press measuring up to 54” x 9’. Students will print on the two traditional etching and relief presses with a maximum area of 18” x 28”. Cost: $100. Instructor: Kyle b. co. Interested in teaching a class? Email industries@as220.org and pitch your idea!